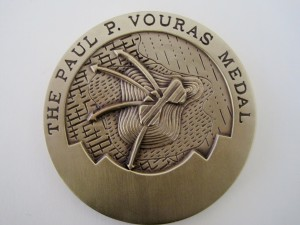 The Paul P. Vouras Medal awards exemplary research conducted in the field of “regional geography.” Created in 1988, this medal was named after Paul Vouras, a Professor Emeritus of Geography at Wiliam Paterson University in New Jersey who wrote many works pertaining to regional geography. His most famous paper is The changing economy of Northern Greece since World War II, which sets the standard for the medal. The medal was designed by Hilary Lambert Hopper.